How to use a bus! This may sound strange, but I have found that many new arrivals struggle to use the bus system until someone has shown them the basics. And yet many locals assume it is obvious. Firstly, there are city buses and post buses. The main difference (aside from being yellow) is that the post buses leave the city and connect all of the region’s small villages and towns. For this reason the post buses tend to only stop at the main stops. The city buses don’t leave the limits of ‘Zone 10’ (St.Gallen city area). If you buy a ticket for the city then it is valid on any bus, but if you leave Zone 10 on a post bus, you will need to pay extra. Easiest way to buy anything from a single journey to a month pass, is to hop on a city bus and use a self-service machine (see below). For annual passes you have to go to the Ostwind Office and you need to already have a Halb-tax. Most buses have no conductor and ticket checks are random. I travel several times a day on city buses, and get checked only 3 or 4 times a year. Travelling without a ticket is wrong and unfair, and I absolutely don’t condone, but if you decide to take this calculated risk you should know that the fine is CHF 80 for no ticket, inspectors travel incognito and only announce themselves once the bus starts moving. Buses 1 & 4 (mainlines) and 5 to the university are most frequently checked. 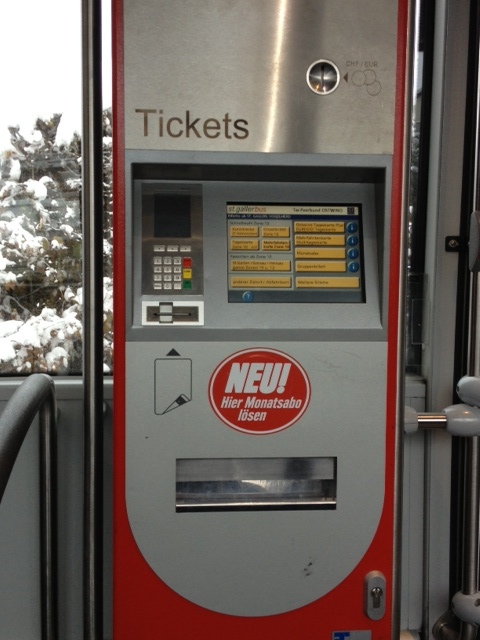 If you have a valid ticket, but forgot to carry it, you will be given a receipt and you need to go to the Ostwind office, show the valid ticket, receipt and pay CHF 5 penalty. Plus you look really silly giving your excuse in front of all the other passengers…! After about 00:30, city buses stop running until about 05:00. Between these times, there are still a limited number of post buses running but normal tickets are not valid. You will need to buy a new more expensive ticket. Also, there are police on each postbus to keep an eye on things – could be good or bad depending on your behaviour :-). 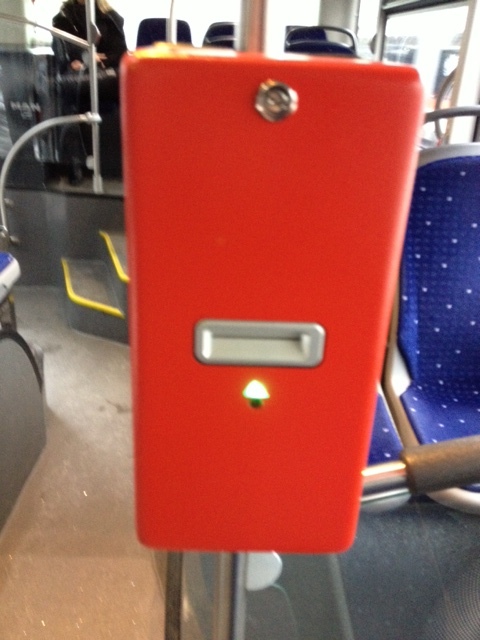 This entry was posted in Transport and tagged Buses by Frankfurt Expat. Bookmark the permalink.